Posted December 9, 2015 by DJ Hookie & filed under Dessert, Eat & Drink, French, Pub Bistro. Descending the stairs of the CBD’s go-to French bistro Le Pub, this seemingly trendy, tardis-like, Parisian-style establishment opens up to reveal an odd mix of the after work drinks’ crowd, family diners, and girls’ night victims. Nonetheless, the tastefully decorated venue is quite comfortable, albeit a little raucous on the evening I dined. Starting with a traditional entree of Escargots de Bourgogne ($24 for SIX!) left me wanting for more garlic butter, and at that price, quite a few more snails. For the same price, the Cocktail de Crabe ($24), was small, yet satisfactory, but reminded me of the 80s more than I’d have liked. Over a valid yet awkward conversation regarding the soundtrack (which ranged from Guns N’ Roses up to anything including David Guetta), we were presented with our mains of Pie Au Boeuf Bourguignon ($25) and Filets de Saint Pierre ($29). 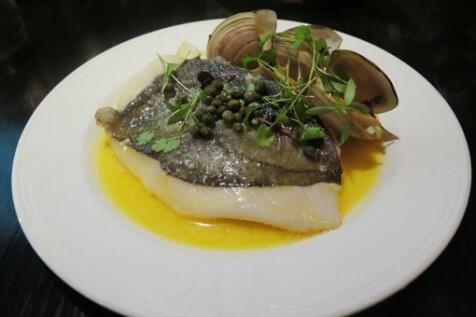 While the flaky topped beef pie didn’t adequately represent the ‘Bourguignon’ to which I’m accustomed, the John Dory fillet was cooked perfectly, with enough flavour to satisfy any pescatarian or fish enthusiast. Finally, the taste of the Creme Caramel ($16) was on point, and certainly sent out the message that Le Pub appears to be punching above the brulee.